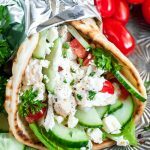 These quick and easy chicken gyros with Greek feta sauce are so super versatile and great for a speedy lunch or a fuss-free weeknight dinner. You can use grilled, baked, rotisserie, or even leftover chicken or go veggie and add sautéed onions and peppers to the mix! Has anyone noticed that I’ve been losing my mind over Greek-inspired dishes lately? You guys are game right? Regardless, just play along! Between Mediterranean-inspired eats and fresh seafood, my cravings have been out. of. control! This predictably happens nearly every Spring and Summer when the tomatoes, cucumbers, greens and herbs are so out of this world tasty that I can’t help but eat buckets of them. I’ve even resorted to growing all the vegetables I need for this recipe in my very own backyard garden. Assuming my thumb stays green enough to see these babies go from “farm” to plate, that is… Wish me luck! You can easily swap out the chicken for grilled veggies and make this gloriously vegetarian. In fact, I’m pretty sure I need to do that tonight – YUM! Are you a total sucker for that crispy char on chicken that you only get from grilling? Grill, baby, grill! I Opted for speed and used my pressure cooker to cook up super juicy, super tender chicken breasts but you can 100% use any cut and any cooking method you prefer! In a pinch you could even snag a rotissere on the way home from work and whip these up supah-fast! This recipe is written to serve two, but can easily be doubled or tripled to feed a crowd. If you love leftovers as much as we do (hello there tomorrow’s lunch!) then absolutely make extra! extra crumbled feta cheese I'm guilty of this one! Yum! First make your sauce. Combine all dressing ingredients in a food processor or blender and puree until smooth. Adjust seasoning/feta to taste. Next chop, slice, and prep your veggies. Warm pita bread either using the toaster oven, oven, microwave, or a heated skillet. 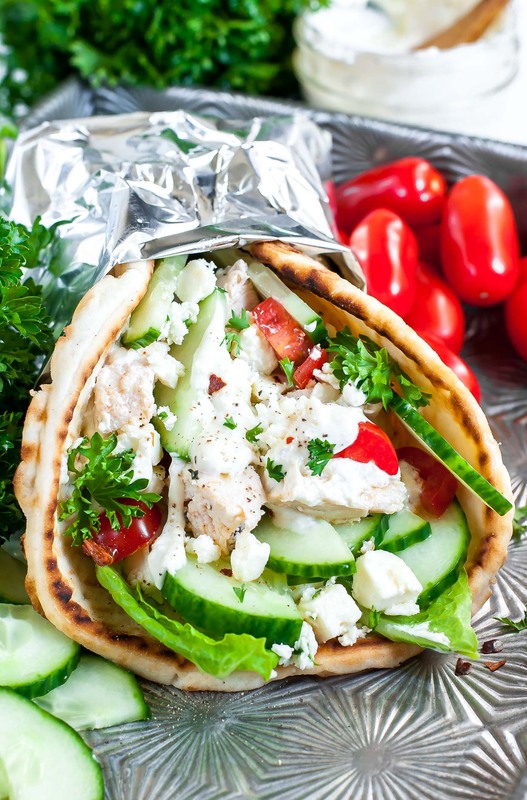 Lay pita bread flat and layer chicken, lettuce, tomato, cucumber, and any additional toppings you'd like to add, then top with a hearty dollop or two of feta sauce. Wrap and secure with aluminum foil, wrapping it around half the sandwich, burrito-style. *You can use anything from cherry tomatoes to plum tomatoes to big juicy heirloom tomatoes for this recipe. No need to really measure, add as much as you'd like on your sandwiches. I mentioned before that I used my pressure cooker to cook my chicken breasts (done in 15 minutes, score!) but you can absolutely fire up your grill, roast it in the oven, use up leftovers, or even snag a rotisserie on the way home from work/errands. Literally anything goes. You can even up the greek flavor by marinating the chicken in my super tasty Greek Marinade before cooking. If you have extra sauce leftover, it's great on everything! 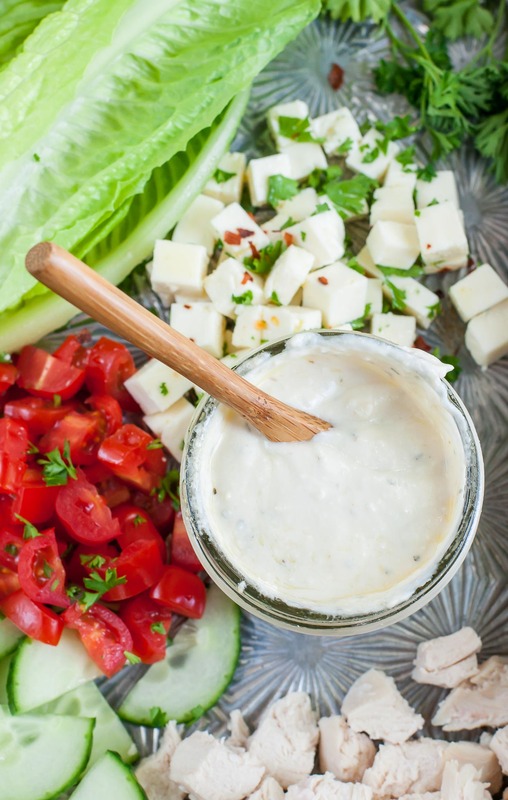 Slather it on turkey burgers, sandwiches, and wraps or use it as a tasty salad dressing! I make this one often and love it on absolutely everything. Sauce recipe yields approx 3/4 cup. Nutrition Facts below are estimated for the base gyro recipe using an online recipe nutrition calculator. Adjust as needed with added toppings and sauce and enjoy! 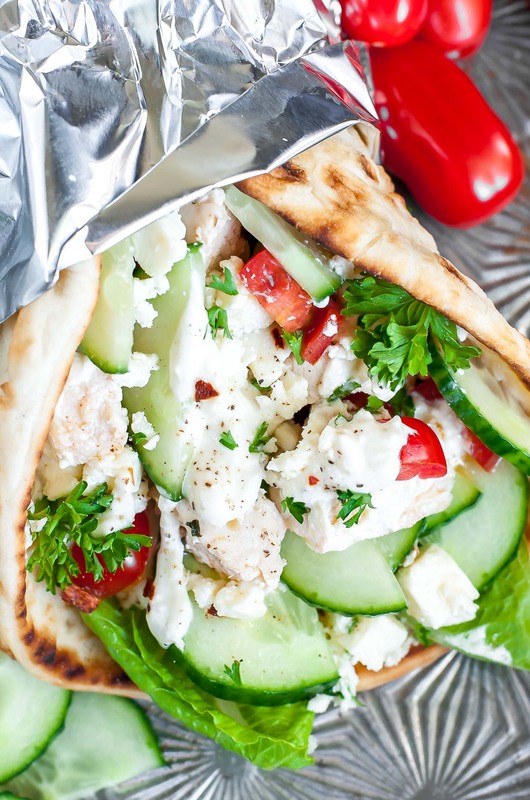 These easy chicken gyros with Greek feta sauce are AMAZING! I inhaled mine pretty much instantly, then photographed Paul’s for this blog post since I’d be wrapping it up for later anyways. As usual, he was flying super late and came home ravenous. Refusing to leave my cozy spot in bed (it was so late!) I sent Mr. Hangrypants into the kitchen to scarf his leftovers. Literally no more than a minute after sending him into the kitchen, Paul stomped back into the bedroom. I was about to tease him for not being able to find his food (this happens a lot, haha!) but instead he just *had to* tell me, full mouth and all, that I needed to make these again. Score! I don’t buy pita bread super often but this recipe is so worth having a few fluffy flatbreads on hand for! I absolutely loved the creamy greek feta sauce that I paired these with, though if your craving a dollop tzatziki sauce (this recipe) is one of my favorites. 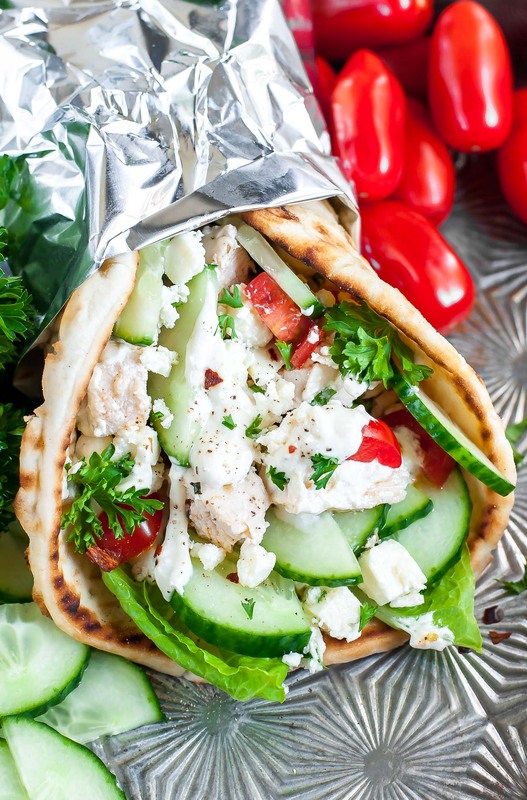 There’s something about a warm fluffy pita filled with fresh crisp veggies, juicy chicken, and a dollop of creamy feta sauce that’s just plain magical. I hope y’all love them as much as we do. And yes, they’re totally on the menu again for next week! It was a no brainer! Do you know how many calories this is per serving? Amazing!!! I love to cook and have tried several chicken gyro recipes, this homemade sauce is BY FAR the tastiest and easiest to make. A new stable meal in our household. The sauce is also great on chicken and salads alone. 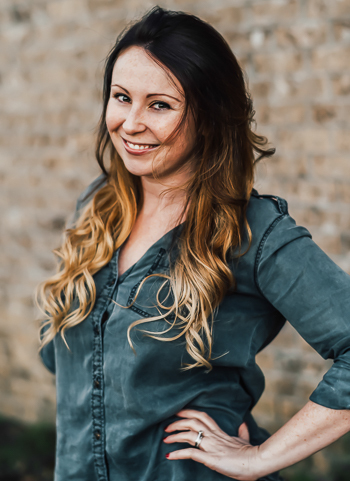 Totally excited to hear it, Jess! Thank you!! So yummy! Even my 12 year old loved it and asked to bring it to school for lunch. Just made these for lunch with leftover rotisserie chicken. Super easy and super delicious! The sauce is to die for! I made two huge gyros but the filling could easily be spread to 3 or 4 pitas. I was craving gyros and had to try this. This Greek feta sauce is soo good! I kept dipping fresh veggies in the leftovers. Thanks for the recipe! Oh yes! This looks so good!!! Thanks Debra! I’m obsessed with it!